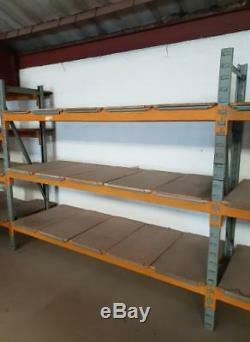 3 x bays as per picture heavy duty pallet racking. 4 x uprights 600 wide x 2120 (7ft) high. 18 x orange heavy duty beams 2440mm. 45 x wood boards to suit. Cash on collection if possible. The item "Pallet Racking Longspan Shelving Heavy Duty 3 Bays 7ft 600mm Uprights 2440 Beams" is in sale since Wednesday, January 23, 2019. 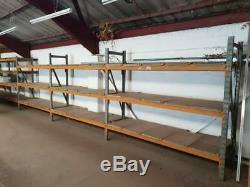 This item is in the category "Business, Office & Industrial\Retail & Shop Fitting\Shelving & Racking". The seller is "timothy_wood_ltd" and is located in Huddersfield, West Yorkshire. This item can't be shipped, the buyer must pick up the item.